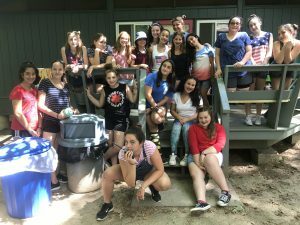 Arayot Highlights – 4th of July and Achla Yom Fun! We have had an action-packed and fun-filled few days here in Aydat Arayot, so hold onto your hats cuz we’ve got a lot to update you on. Tuesday was the 4th of July and the entire camp joined together for a parade winding through the entire property. We all dressed up in costumes and red, white, and blue, finally making our way to Beit Am for patriotic singing and dancing. Before dispersing to our normal afternoon peulot (activities) we picked up cupcakes for a special 4th of July nish nush (snack). Next we all gathered in the chadar ochel (dining hall) to learn how to meltz (be waiters for camp during meals). 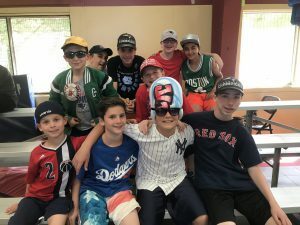 All of the chanichim (campers) are very excited about the opportunity to learn new skills and experience meltzing as the newest members of upper camp. After we learned the tricks of the meltzing trade, we packed our lunches for achla yom (cool day) taking place the next day. We finished off the afternoon with rikud (dance practice) for our upcoming Ketzev performance. The dances are looking great and we can’t wait to share them with a real audience!! Critics have been calling Wednesday the “best day ever” and the “most fun achla yom of my life” and we wouldn’t agree more. 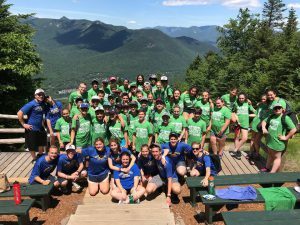 Arayot went to Loon Mountain for achla yom and it was a perfect day from start to finish. We woke up a little earlier than the rest of the camp, but it was so worth it because we were on the road by 8 AM and jumping all over Loon by 10! We spent our morning zip lining, bungee jumping, climbing the rock wall, and getting lost in the corn maze. When it was time for lunch we all boarded gondolas and enjoyed a smooth and relaxing ride right up the mountain with a gorgeous view of the surrounding peaks. Once we reached the top we settled to eat lunch in front a gorgeous view of the mountains. After a few group photos, we started sending groups to explore the caves at the top of the mountain. It was so fun squeezing through the rocks, nooks, and crannies that wind around the mountain. The day didn’t end there. Once we were down the mountain we headed over to the cascades so that we could enjoy the natural waterfalls and cool off in the water. We finally finished off the afternoon with ice cream and headed back to camp, happy and sleepy, with our amazing bus driver, Ken. We arrived back in camp just in time to change into white shirts and head down to dinner for a delicious BBQ. After dinner we had a paint night involving paint and games and a friendly paint extravaganza to top it all off. That brings us to Thursday… just another wonderful day at Machaneh Yavneh. Thanks so much for tuning in to this edition of the Arayot blog!